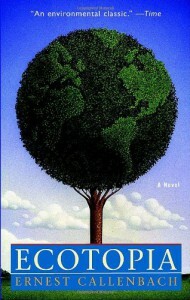 I went into Ecotopia not expecting much in the way of serious character studies or deeds of derring-do. What I expected was a typical utopian/dystopian novel where the author focuses on describing the virtues or faults of their imagined society at the relative expense of all else; and I wasn’t disappointed. I was pleasantly surprised, however, at how well the novel read. It’s constructed as a series of articles and diary entries written by William Weston, the first American (officially) allowed to enter Ecotopia, the nation created 20 years previously by the secession of Washington, Oregon and northern California. The articles describe Ecotopian society, which is based around the ideal of a sustainable, modern society radically different from the growth-oriented, extractive society we’re currently saddled with. The diary chronicles William’s immersion in Ecotopian life and culminates in a near-religious epiphany, where he realizes he can’t return to the United States. Not “highly” recommended, perhaps, but definitely recommended if your interested in the utopia/dystopia genre or environmental concerns.